Kolo Mee is another popular noodle dish in Kuching. It consists primarily of boiled egg noodles and a garlic or shallot-flavoured broth that’s made with vinegar or peanut oil. Typically, minced beef or thinly-sliced char siew (barbequed pork) is added as a finishing touch to this gratifying meal. The local Sarawak laksa is a creamy, spicy, local variation of Malaysia’s ubiquitous soup-noodle bowl. Jumbo prawns, fresh lime, and coriander lend a unique flavor to the broth which is thicker than that found in most noodle bowls – heavy but delicious. The noodles are usually made from thin vermicelli. Kampua Mee is synonymous to Foochows, as Kolo Mee (Hakka, but then again the Teochew will dispute this) to Kuchingnites or Wonton Mee to Cantonese. I think all “Kań Mein” is the same everywhere, no matter what name you stick on it. It’s the make of the noodle that differentiates them from one to the other; its firmness/softness, texture and size. Think about it… in the old days, there weren’t any commercial cooking oil, and home-made lard is the word. To this day, the Foochows are sticklers to its original recipe: lard, MSG, spring onion and fried shallots (no matter its cost). If you try only one unique, local food in Kuching, make it midin. Pronounced “mee deen”, midin is a green jungle fern that grows in Sarawak. Unlike other greens that get soft when cooked, midin remains crunchy giving it an enjoyable texture. The thin, curly shoots are a delicious and healthy alternative to noodles and rice. 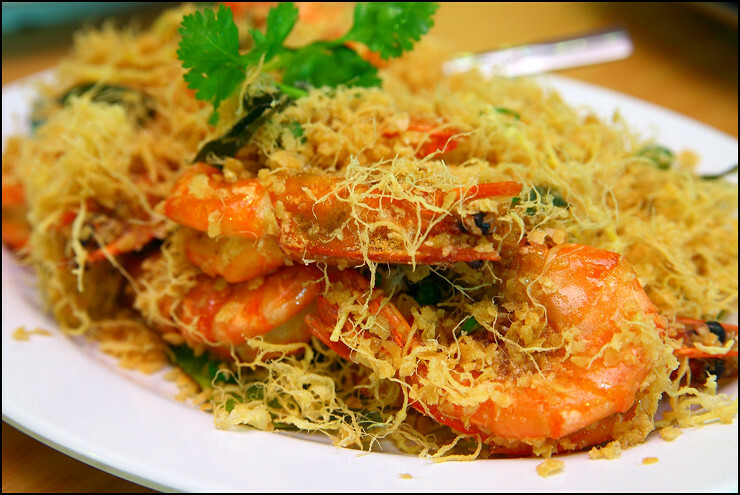 Midin is often stir-fried with garlic, ginger, or optionally shrimp paste and chili. Ayam pansuh is typical among the people in Sarawak. Ayam pansuh is a dish prepared by cooking chicken meat in a bamboo and stuffed with water (which later will be the soup), seasonings and covered with tapioca leaves (later could be eaten together with the cooked chicken). Tthe Ibans and the Bidayuhs (people of Sarawak) always prepare this dish on any celebration days, especially the Gawai Dayak (celebration for the end of harvesting). Curry leaves lend an Indian influence to this Malaysian seafood recipe.